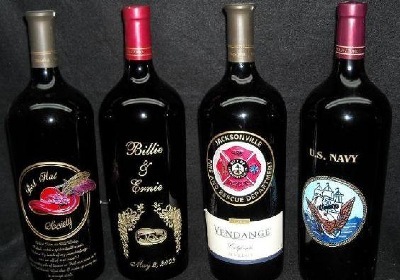 Personalized bottles of wine or liquor make perfect holiday gifts, wedding gifts, retirement gifts, etc. It’s a gift that truly makes a lasting impression. With a design for all occasions, etched wine bottles have all of your gift giving needs covered! Add your own custom, personalized message to any etched wine bottle for a one of a kind gift idea that is sure to wow your lucky recipient, or simply treat yourself to an etched wine bottle gift that you will remember forever. Personalized wine bottles make great wine gift ideas whether your recipient is a wine connoisseur or casual drinker. The recipient of one of our custom engraved wine bottles will not only remember the occasion but they will remember the giver. Unlike bottles with custom labels that get ruined when wet, engraved wine bottles and engraved liquor bottles make practical gifts. When emptied, each bottle serves as a unique vase, water decanter or candle holder, to name a few ideas. I have found that most people don’t drink it at all, but leave the wine intact for a truly amazing display. Each wine bottle is deep etched by sandblasting and then skillfully hand-painted, creating a stunning piece of artwork for you or your lucky recipient!